Mr Manjaly has carried out medico-legal work since 1997 and produced an extensive number of professional medical reports. A particular focus has been on noise-induced hearing loss and whiplash injury claims, but he has been instructed with regard to the full range of Ear Nose and Throat injuries. He recognises that his duty in this is to the Court and ensures reporting is impartial, professional and accurate. He keeps up to date with developments within medico-legal reporting, especially with regard to noise-induced hearing loss and tinnitus. To date, he has only been instructed on behalf of the Claimant but has extensive experience of supporting an initial report including appearances in Court. The office has a reputation for excellence and efficiency, liaising with patients, clients, agents and solicitors to ensure everyone receives a professional service within agreed timescales. Mr Manjaly has a weekly clinic at his private clinic rooms in Eastbourne and we are glad to receive individual clients. 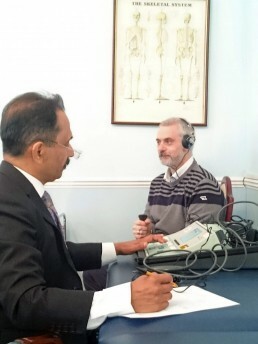 We have a good relationship with a local senior audiologist for audiometric testing where necessary. We are happy to liaise with your clients and arrange a mutually agreeable appointment. Similar to the London clinics, these are arranged every 6 weeks or so, currently at the Medigold clinic. We arrange a monthly clinic in central London, currently at the Marriott Hotel, Marble Arch, and are glad to receive individual instructions to see clients. We always have a senior audiologist available as part of our clinic. We are happy to liaise with your clients and arrange a mutually agreeable appointment. Mr Manjaly travels extensively and we are regularly arranging/attending clinics in places from Bristol to Norwich, Newcastle to Plymouth.